The generous guys at Bet365 are offering a FREE in-play bet up to £50.00 on tonight’s match in Madrid (Full details can be found HERE) and we have an easy to follow guide to help reveal how to lock in a profit, whatever the result. Before kick off find a bet that you can closely match on the exchanges, i look for one that will give you as close to zero loss as possible. In the Over/Under, and Match odds markets, you should be able to find one that is close. 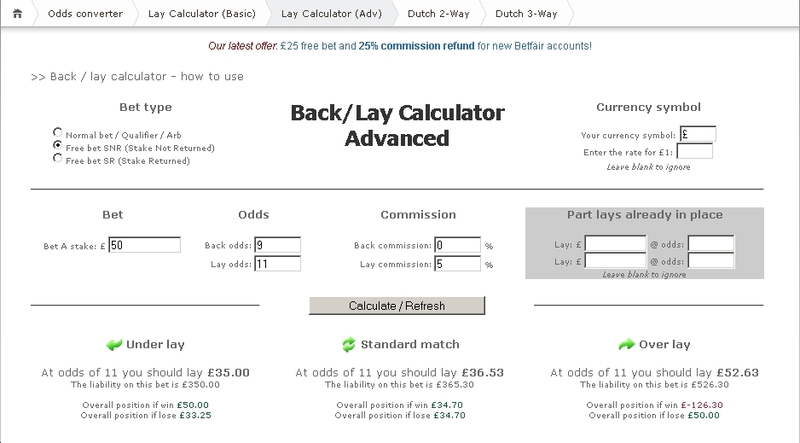 You can use this calculator to calculate your qualifying bet stakes, ticking the Normal bet / Qualifier / Arb as the Bet Type. Look for a reasonably high odds bet such as correct score (odds in the region of 6-15 are ideal but you can go higher or lower). Make sure you tick the Free bet SNR (Stake Not Returned) button as the Bet Type, fill in the numbers, you can then place your back bet on Bet365 and then the Lay bet on the exchanges. 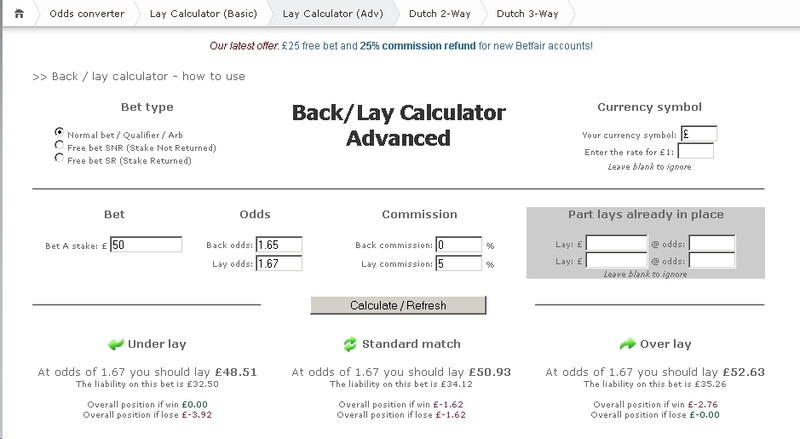 You can play around with different markets/odds on the calculator. You can Underlay, Standard Match or Overlay, you can choose, I generally Standard Match for this type of offer.Sit back and wait for your money to arrive – Simples. If you enjoyed this article, you can find more advice on how to make a profit betting available as a Smart Betting Club member. The great news is that all of this available for the equivalent of just £1.52 per week and with a full money back guarantee if you are not in any way satisfied once you join. To help showcase the type of content you can expect to receive as a Smart Betting Club member, you can now download for free our recent review of the profitable GT Tips Rugby & Horse Racing service. First published in SBC magazine #81 last month, you can read our complete independent analysis of just why we rated their service so highly. As our review indicates their mixture of free and paid for tips have generated excellent long-term profits, which we have personally tracked and proofed since September 2012. Indeed, since we penned this review 5 weeks ago, GT Tips have continue to thrive with over 80 pts combined profit from both their highlighted Racing and Rugby tips services. Regular Reviews On Even More Profitable Tipster Services. If you enjoy this free review, then you can find many more on countless other profitable tipsters in our regular Smart Betting Club magazines, available to all our members. Since we began back in May 2006 we have reviewed hundreds of tipsters, helping us to identify the best, most profitable services that you should follow to make money betting! Don’t forget, the Smart Betting Club is 100% independent so when we say a tipster is worth following – it’s because its true and not because we have a vested interest. Sign-up today and gain instant access to all SBC content. You can win the chance of £25 cash and a year’s free Smart Betting Club membership, simply by entering a free tipping competition next Wednesday, ran courtesy of our friends over at Easyodds.com. To enter, all you need do is post up your best tip on the Easyodds Facebook wall this coming Wednesday the 24th March. If you bag the biggest winning tip on the day, then you will scoop the free SBC membership and take home £25 in cash to boot! 1. 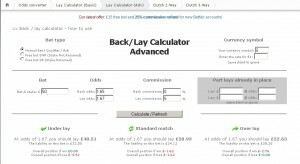 Post on the Easyodds.com Facebook wall this Wednesday (24th April) with your best tip of the day – this can be across any sport on any market. 2. Whoever chooses the biggest price winner on the day will be declared our Wednesday Wager champion. One of the unsung benefits of a Smart Betting Club (SBC) membership is the ability to access our vast archive of tipster reviews, expert betting guides and interviews. As soon as you sign-up for a membership, you gain access to our full 7 year back catalogue (Yes – next month is our 7 year anniversary of helping punters make money!). This back catalogue is vast and includes the ability to read hundreds of our past independent tipster service reviews – helping you find the most profitable tipping experts (and more importantly those who have a track record in the long term). You’ll also discover countless betting strategies and ‘how to’ guides that you can apply right now to help make your betting more successful. The great news is not only do all SBC members get access to our entire back catalogue at no extra cost, you can also get exclusive insights into the best up and coming tipsters each and every month via our regular SBC magazines. We cannot guarantee that new members will continue to gain free access to this back catalogue, so to secure your access, consider becoming a member of the Smart Betting Club today. Over the years there have been many famous double acts… Laurel & Hardy, Torville & Dean, Shearer & Sheringham and not forgetting of course – Howard Webb & Manchester United! In betting, pairing two good bets as a double act can be a great way to increase your returns, but there is obviously some extra risk. For those not aware, with a double bet, you need both bets to win instead of betting on single outcomes. As this is less likely to happen, the odds are much bigger than betting on singles. Allow me to explain in a bit more detail. So, if you think that Aston Villa to beat Fulham and Wolves to beat Huddersfield are both 50/50 shots, then the odds in theory should be 2.0 (evens). If you are able to get anything above 2.0 (evens) on those matches, then you’ve got a value bet and should make a profit in theory. A quick check at the odds available at the bookies shows that both Wolves and Aston Villa are available at around 2.20 (6/5). 2 Single Bets: Back Wolves & Aston Villa at 2.20 as 2 single bets. Potential profit if both win: 2.40 points. If you continue to back enough 50/50 shots at 2.20 then your long term profit will be a 10% Return on Investment (£10 won for every £100 staked). As a comparison, if you placed those exact same bets just as doubles, your return on investment rockets to 21% (£21 won for every £100 staked). If like many of us, you have a busy life – then when it comes to betting, many of you will simply want to know exactly who the best tipsters to follow actually are. All of these questions and more are answered courtesy of the latest Smart Betting Club Tipster Profit Report (published yesterday) which features results tables from 54 of the best tipster services out there. All of which has been designed to enable you to quickly and easily find the right tipster to start bashing the bookies with! Each Tipster Profit Report features our latest ratings, analysis and results details for 54 of the best tipsters we have uncovered in our near 7 years monitoring the tipster industry. The team at SBC have personally tracked and reviewed each tipster featured – analysing every aspect of their service, so you don’t have to! We also help you to compare each tipster through our unique ‘Best Buy tables’, where we list the top performing tipsters to a number of different measures. Making it easy to find the right tipster(s) for you. It’s easy to use and finally brings a level of professionalism to an industry that has been crying out for a reliable comparison site…and as we are 100% independent you can be assured that when we say a tipster is good, it’s because they actually are! When you consider that the top ten tipsters on our books average between 370% and 87% betting bank growth in the past 12 months alone (after subscription fees) then it’s clear just how helpful this latest report can actually be for you. For example, check out the top tipsters from our Best Overall Tipster Service table below, which lists the top performing tipsters from the last 12 months if working to a £2000 betting bank. This is after each tipster’s subscription fees have been deducted so is completely realistic. Not only this but it also includes other key figures such as Return on Investment (12 month ROI) and Return on Capital (12 month ROC). Service 1 has made a £5,999 profit in the past 12 months and all from just the £2,000 starting point. Even Service 10 has made 87% growth in the past year with a £1,740 profit. What’s more, we are uncovering more and more top tipsters every month as can also be observed by the two new entries at number 3 and 9 in the table above. Both were reviewed in the March edition of the SBC Magazine. You can pick up your copy of this latest Tipster Profit Report instantly, by signing up for a Smart Betting Club membership today. Our unique SBC ratings and Key Facts Page for each of the 54 tipster services. Our Hall of Fame rankings – those we consider the best tipsters for making money betting and recommend to you. In-depth analysis and commentary on individual tipster performance. Details on the unique savings, free trials and deals available to many of these 54 tipsters via the SBC Discount Club. P.S. All new Smart Betting Club members get our Secret Betting System Guide absolutely for free the instant they join. It includes the free Golf Betting System that made £8,330.50 at £50 level stakes during a live trial last year. Ideal for those of you betting on the Masters! It’s all eyes on Aintree tomorrow for the Grand National, which is not only the race that stops a nation, but also in my view – the race that makes the most profits…but only if you are a bookmaker! It’s easy to see why too, not only are there 40 runners going to post with the likelihood the majority might not even finish, but also the ridiculously high over-round that the bookies work to. For the Grand National this can be as high as 140 or 150% – basically the larger this number the greater chance the bookies coffers will swell come Saturday Evening. In comparison, most races such as those being run today at Aintree see an average over-round of up to perhaps 110%. Still, if like me and you like to have a punt on it anyway, you will want to make sure it’s an informed one and with that in mind, you need to be very careful who you bet with especially if betting each way. Victor Chandler for example are paying out on the first 6 horses to finish the race, whilst Bet365, Skybet, Boylesports, Paddy Power & Stan James will pay a return on 5th spot. On the flipside, Totesport, Betfred, Ladbrokes, Coral & William Hill should all hang their heads in shame as they only pay out on an each way bet if your horse finishes 4th or higher! As much as I enjoy watching the Grand National, I am always acutely aware that it’s just one race out of thousands each year where I can make a profit.